Successfully Added Premium Ed. Quad Band Dual SIM Dual Camera TV Phone + Bluetooth to your Shopping Cart. 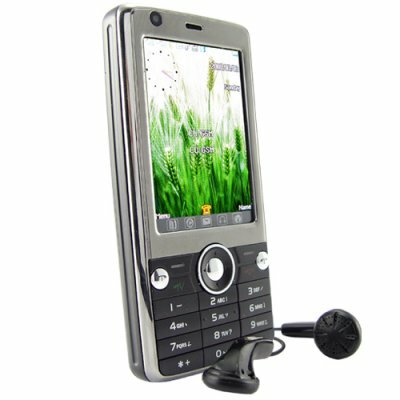 Amazing full-featured touchscreen cell phone: unlocked, universal GSM, with accelerometer "shake" navigation functions. The M25 Premium Edition Quad Band Dual SIM Dual Camera TV Phone + Bluetooth features a highly responsive touchscreen display, accelerometer motion sensitive functions and tons of multimedia entertainment options. Busy people need a phone that can keep up. With dual SIM and dual standby, the M25 lets you have two active phone numbers at the same time on a quad band mobile phone that works all over the world. What more could a modern frequent flyer want? Packed with the latest high-tech entertainment options, this phone will never leave you bored. Use the front and rear cameras to take videos and pictures of you and your friends. Play MP3s and videos, enjoy analog TV and FM radio. You can even customize your phone's wallpaper, welcoming text and hotkeys. Then personalize your phonebook by assigning pictures, music, and videos to your contacts and contact groups. This phone lets you show your own style just the way you want. This phone was designed for easy use. Take advantage of the accelerometer to navigate through menus with just the flick of a wrist. The display image automatically rotates left, right, and even upside down to fit your viewing preference. A protruded keypad and highly responsive touchscreen make dialing and navigation easy. The M25 Premium can pair with Bluetooth devices for handsfree calling on SIM card 1 and 2. Stop working on your phone, and start making your phone work for you! Get yours today and don't forget to order more to save more! The M25 Premium Edition mobile phone is brought to you by your best choice for high quality, low price electronics, Chinavasion. Quad band touchscreen cellphone for worldwide business and personal use. Highly responsive touchscreen for quick navigation. Double the convenience: dual SIM, dual standby, dual cameras and Bluetooth on both SIMs. Call Secretary: Plays an audio message for callers when you are too busy to answer and logs missed calls. - Delay Timer: 5 sec., 10 sec., 15 sec. - Screen Rotate: All phone menus, displays, and functions rotate to match phone orientation, including left, right, even upside down! Does this phone have ___________ language? The phone comes with the languages listed above. If you need any other language and plan to order a large quantity (25+ pieces) then we may be able to supply this model with your choice of language(s). Does this Premium Ed. Quad Band Dual SIM Dual Camera TV Phone + Bluetooth come with a digital TV tuner as well? No, the cell phone only comes with an analog TV tuner. Does the phone come with a prepaid SIM card or on contract? The phone does not come with a prepaid card. The phone is contract-free, it is fully unlocked so it can work on any network you choose. on 2009-05-15 19:53:31 Excellent phone! A TV funtions is awesome, is little and practice. This price is great too. This is a wonderful phone and stylish for its price. The phone works well and possesses everything any other expensive phone might have. Cool stuff!! !